Wow. This is MAJOR. BANANAS. My love Rachel Zoe and longtime assistant Brad Goreski announced to People today that they are amicably going their separate ways. What happened? Has Brad had enough of Rachel's neediness? Does he want his own fame and brand? Who knows. I am sure time will tell. Maybe I should apply to be Rachel's assistant. I DIE. Let's take a look at some of their memorable fashion moments! We all love giving and receiving a heart felt, handwritten card. There is something old fashioned about it. It is a personal touch to any gift or alone in itself. Some trendy notes recently discovered are from a design studio started in Brooklyn called the Walk Up Press. All Walk Up Press stationery is designed and letterpress printed by hand. Elizabeth diGiacomantonio and Joseph Traylor started Walk Up Press both being post graduate design students brought together as random roommates in a walk up apartment building in Manhattan's East Village hence the name and inspiration. Now long time friends and Brooklyn residents, they work together to design and produce letterpress stationery that reflects the attitude that they have come to love so much about living and working in New York. The stationary cards are so simple and just plain cool. There are so many to choose from to say exactly what you are thinking. Just look at the He Said, She Said collection which allows you to fill in the blank personalizing the message for any occasion. "Sending a someone a handwritten note is something that people do less and less nowadays, and because of that, giving someone a card is a really special thing," Elizabeth says. "The problem is, when we wanted to send a card to someone, we always had trouble finding ones we really liked, so we started to design our own, the kind of cards that we would want to buy, and hoped other people would like them too." Walk Up Press products are available online at www.walkuppress.com, and at retailers throughout the country including New York, Brooklyn, New Jersey, Chicago, San Francisco, Los Angeles and internationally. The insanely adorable Eleanor Grosch Diaper Bag ($90) allows for fashion and function to come together. Eleanor Grosch is a renowned animal illustrator which is what brings this bag to life with it's trendy peacock design and deep navy color. The diaper bag is so roomy it includes a bottle bag for insulation, zippered pouches and a fold-out diaper changer pad for those uncomfortable situations. An adjustable shoulder strap allows for customization on anyone! With this bag, you'll be the most stylish and organized mom on the playground. Available exclusively at My Baby Boutique! Recently I partnered up with My Baby Boutique; a unique baby boutique. Look out for stylish clothes, hats, gifts, headbands, and more. We are giving away this Peacock Diaper Bag to Blonde Ambition readers as a thanks for your stylish inputs. To Enter: Simply leave a comment on what you love about baby fashion, suggestions for future baby posts, or a story about your little one's fashion sense! Congrats to Julie of The JQ Lounge who is not also a fellow blogger but pregnant with her first! Congratulations Julie. Be sure to stop by her lounge! 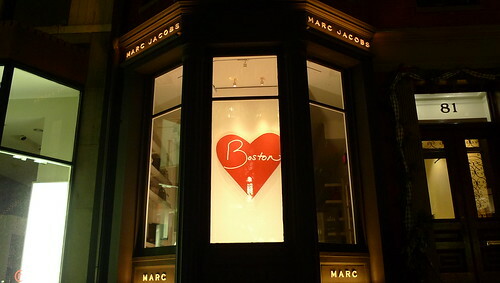 Marc Jacobs on Newbury Street has an amazing array of accessories from umbrellas to nylon bags. Unbelievably, they are not that expensive. Travel into Marc's world and find some unique gifts for friends or perhaps a treat for yourself. Two floors of accessories, there is something for everyone ladies and gents. Don't be intimated by the name but grab a little designer something that won't cost a pretty penny. For the writer in you, grab this lipstick pen at only $5. Hating your old key chain, try this little metal airplane (key chain; $8) one that makes putting your keys on not feel like a chore. Need a new bauble to cheer you up, Marc has plenty of rings, bracelets, and necklaces like this wishbone necklace ($10) for under $20. Fall is here and Marc Jacobs is prepared. Last night was a blast for me. First, I stopped by WHDH Channel 7 News to do my web chat for my Bargain School Shopping segment. I was amazed by the studio as producer Melanie Nye showed me around. It is unreal; televisions everywhere. Watching the newscasters in action was a treat and I even got to joke around with them. I was seated next to KC Downey, who is also Editor of Sports of Boston, Melissa Turtinen and Alexandra Weishaupt. They were my web producers for the evening. 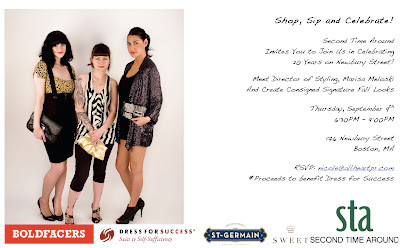 Next stop was the Second Time Around Consignment shop anniversary party hosted by Nicole Kanner of All Heart PR. There were lovely cupcakes by Sweet, punch with St.Germaine, and amazing designer labels at extraordinary prices. It is my new favorite shop. Not to mention Marisa Meloski, Director of Styling, who was on hand to help style guests. Proceeds benefited Dress for Success. Great night. There is an amazing little deli in Palm Desert, CA. No, it does not butcher meats, but instead whips up amazing face and body products. The Body Deli products are created nutrition for the skin inside and out. They only use raw, fresh, natural and organic ingredients. The Fruit Smoothie Masque is a treat at just $24.00. This mask is used as an exfoliating treatment with Papaya Enzymes as the main ingredient. The result is silky, dewy skin. Every product that The Body Deli creates is in handmade, small batches so you know you are receiving the freshest product around. For those who can't get to California, The Body Deli ships. Some products even require refrigeration so they remain invigorated on the journey. They are put in the "Ice Box" and shipped right to your door. Interestingly enough, our skins cells "respond better to ingredients that are enzymatic-ally alive." Each product even has an expiration date on the jar so you can get the most out of it. The Body Deli is so innovative in their research on skin care. The whole concept is just cool. With a takeout menu and the store transformed to resemble a deli, it is an experience. Try it for yourself. There are products for EVERYONE. Stella and Dot offers some of the most beautiful afforable jewelry for anyone. With so many different styles and options, Stella and Dot has created a jewelry playground. Started by Jessica Herrin who co-founded WeddingChannel.com, Stella and Dot "is a company inspired by and created for strong women- just like you." The selection of rings, earrings, bracelets, and more is absolutely breathtaking and sure to get you noticed around town. The Alexa Fringe Necklace ($89) is a favorite for the fall. With rose gold plating and champagne chain stones, it is a show stopper. There is a velvet ribbon for closure allowing for the length to be adjusted at your desire. Wear it long or short depending on your outfit. This necklace will dress up any t-shirt and jeans or take you from day to night. Stella and Dot is a major wardrobe staple for fall! 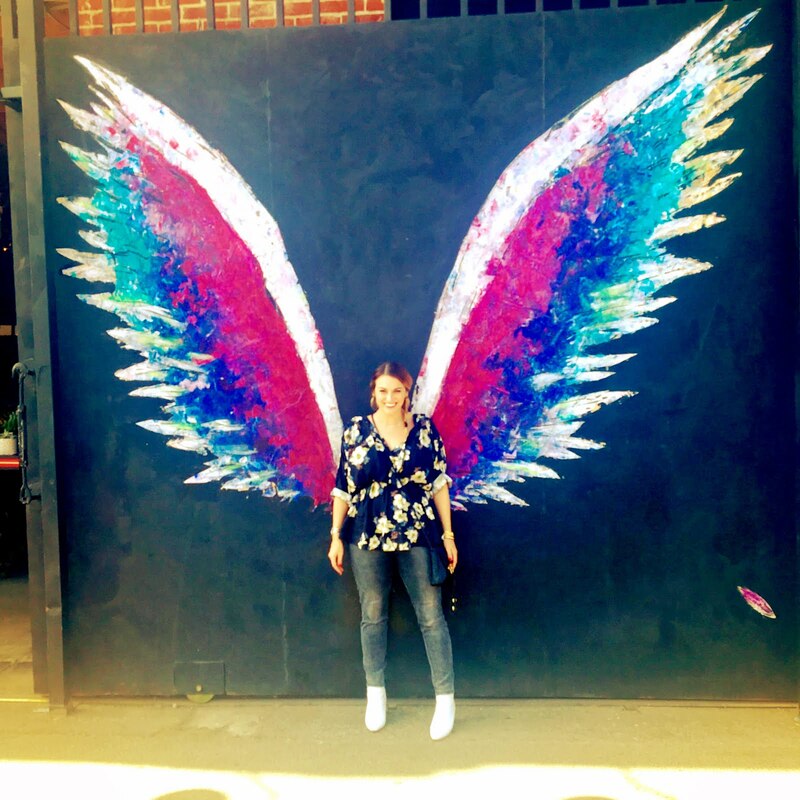 Celebrities like Debra Messing love Stella and Dot too! Stella and Dot sent me a gorgeous Alexa Fringe for myself and I have not taken it off since! It is insane! For your own piece of Stella and Dot contact Caroline Stone at Stella and Dot. I adore jewelry. I am sure that is clear. Let me tell you I have never seen such well crafted, insanely beautiful designs like designer Tomasz Plodowski envisioned in his work. Created in Poland, his collection consists of handmade modern jewelry inspired from a fascination with architecture and art. This amazing company emerged because of the overwhelming response to Plodowski modern jewelry initially made in an atelier. What I love about these rings is the technical, structural portion set with so many gorgeous Swarovski stones. This obviously comes with his love of architecture. So stunning and innovative, they are protected under patent. "My designs go against what has been considered canon in this industry so far, and our customers have absolutely supported this fresh look at jewelry." says Plodowski. He is surprised by the growing amount of diverse customers starting from college co-eds to ladies who brunch. "All of them, however, share the ability to appreciate beauty and a desire to have something really unique; something that will not change after a season and that will please not only the owner but also the people around her." Plodowski shares.